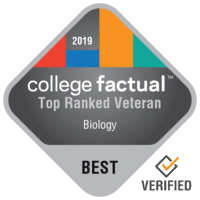 Newark, New Jersey – College Factual released its 2019 national and state rankings for Best General Biology Programs for Veterans. New Jersey Institute of Technology performed very well in these rankings. NJIT’s Biology program is ranked #91 out of 820 for veteran friendliness of all colleges and universities reviewed by College Factual. This puts NJIT in the top 15% of all schools in the nation when it comes to offering a quality education to veterans studying Biology. NJIT improved its ranking position 55 slots over the previous year’s ranking of #146. See the full ranking of Biology programs for veterans. New Jersey Institute of Technology’s Biology program is ranked #4 out of 22 colleges and universities in New Jersey reviewed by College Factual for veteran friendliness. This puts NJIT in the top 15% of all schools in the state when it comes to offering a quality education to veterans studying Biology. NJIT improved its ranking position 1 slot over the previous year’s ranking of #5. See the full ranking of Best for Vets Biology programs in New Jersey. Based upon PayScale survey data*, a student who graduates from NJIT with a degree in Biology realizes average early-career earnings of $37,931 and average mid-career earnings of $76,813. This is above the national average for all Biology graduates who make $37,480 in their early career. It is also higher the average graduate’s mid-career salary of $68,756. Learn more about majoring in General Biology at NJIT.